I love those sandals! They're so cute! I'm loving studded sandals and lacy dresses! Love this top on you! I love this whole outfit! It looks like something I would wear haha. Off the shoulder for the win!!!! 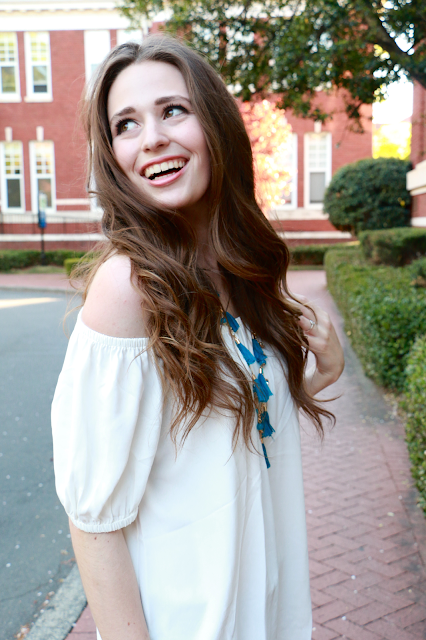 Such an adorable trendy look! Great job making it through a difficult week, graduation is in sight! Hooray! Love an OTS top and that necklace is adorable! I love your top! I'm super excited to wear off the shoulder tops this spring. Love your shoes! I also love off the shoulder shirts. I have a few from the store GARAGE and I've worn them for years! I love this outfit and your hair looks gorgeous! Good luck on your presentation and this outfit is just so cute! Hope you have a wonderful week pretty lady! Beautiful look ! You looks so cute. Thanks for sharing! 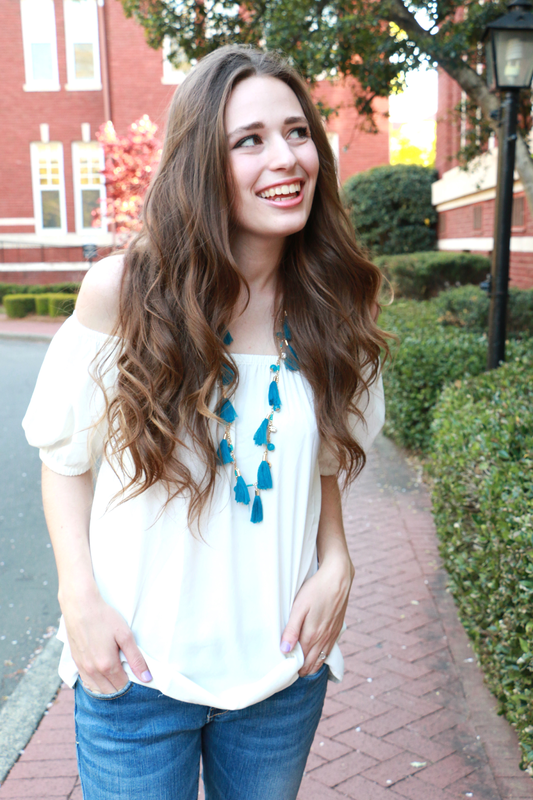 That tassel necklace is adorable!! I'm such a fan of anything with tassels haha. I am so obsessed with this trend and you pull it off SO well! LOVE it! Good luck on your presentation! I'm sure you're going to kill it. I'm loving the off the shoulder trend, you look so adorable! Your hair is absolute perfection! Love this whole outfit! That's such a cute off-shoulder top! This top is so cute! Love it!